I don't know about where you are, but here in Boston it's been absolutely FRIGID this week. We've had such a mild winter so far that once we did hit the low 20s, it was torture. And when the temps are that low, I need something hearty to warm me up. That's where this recipe comes in. I'm originally from Central New York - specifically a tiny little town north of Utica. Utica is known for its amazing Italian food such as greens, pasticiotti and chicken riggies. If you've never heard of chicken riggies, I suggest you get acquainted with them STAT. 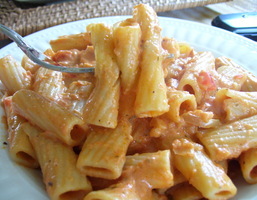 It's rigatoni and chicken in a semi-spicy pink cream sauce. Rachael Ray even featured them on her Food Network show! They're TO.DIE.FOR. And I'm happy to be able to pass my mom's recipe onto my readers. Heat oil and butter together over medium-high heat until melted. Add shallots, peppers and garlic and cook until translucent. Add chicken, cook 8-10 minutes. Add tomato sauce and cook for another 10 minutes. Add cooking sherry and simmer for another 10 minutes. Add heavy cream and cook for 10 more minutes. Season with salt and pepper to taste. Add cooked pasta and let sit for a few minutes before serving to soak up the sauce. That looks amazing - I really want to try it now! I was looking for a recipe for chicken riggies after reading about it in a blog, and kept finding "special" versions with this or that added (even shrimp - come on people!). I was sooo happy to find your mom's recipe here - just what I wanted: the home-cooked tried and true recipe that has apparently become a cultural icon! Thanks so much - it looks awesome and I can't wait to make it for my family!